You will also be able to use your own computer to do the labs for this course. Lab Assistants: The following Lab assistants will be available during the week (names and schedules will be posted by the end of this week) for assistance on lab assignments. 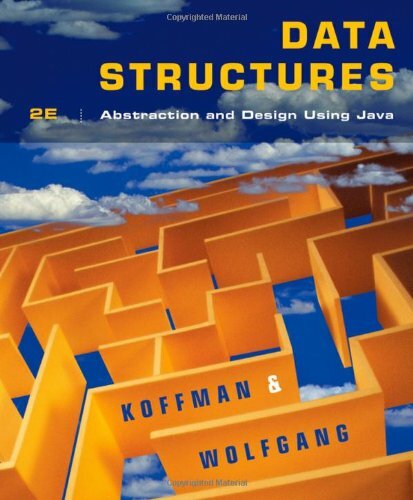 Data Structures: Abstraction & Design Using Java, 2nd Edition by Elliot B. Koffman & Paul A. Wolfgang, Wiley 2010. Available at the Campus Bookstore for $164.50. Also at amazon for $100.74 (much lower options also available) click here. JDK 7/8 (Java Development Kit) + Eclipse for Java Developers. This software is installed in the lab computers. You may install it on your own computers. To get JDK, click here (be sure to get the JDK - Java SE Version) and to get Eclipse click here (again, be sure to get Eclipse for Java Developers). Follow the installation instructions provided. There will be no support provided for installations on your personal machines. Course Description (from the Course Catalog): Introduction to the fundamental algorithms and data structures using Java. Topics include: Object-Oriented programming, program design, fundamental data structures and complexity analysis. In particular, searching, sorting, the design and implementation of linked lists, stacks, queues, trees and hash maps and all corresponding complexity analysis. In addition, students will also become familiar with Java’s built-in data structures and how to use them, and acquire competency in using a professional grade IDE. Overview of Data Structures: data, data abstractions, structures, algorithms, implementation, IDEs. Assignment#1 (Due on Wednesday, January 28): Click here for details. Assignment#2 (Due on Wednesday, February 4): Click here for details. Assignment#3 (Due on Monday, February 16): Click here for details. Assignment#4 (Due on Monday, March 2): Click here for details. Assignment#5 (Due on Monday, April 6): Click here for details. Assignment#6 (Due on Monday, April 27): Click here for details. January 19: No Class. Martin Luther King Day. January 21: Course introduction, adminstrivia. Looking at data, data abstractions, structures, algorithms, etc. Processing/Java review. Read: Appendix A from K&W, Chapter 1 from K&W. Sample Processing code: The USPS Volume Processing program (without the data). If you'd like, you can get the data from here. Python Graphics Library: Visit this page if you need information on doing simple graphics in Python. January 26: Java Basics: program structure, basic input/output, simple dialog-based I/O, Data types and variables, constants, type conversion, reference variables, arrays, statements, methods - class methods and instance methods, error detection and correction: exceptions, try-catch blocks. Lab#1: Be sure to work through the Lab handout from class. You have to hand in your Lab Report on Monday, February 2. January 28: Java Basics: program structure, basic input/output, simple dialog-based I/O, Data types and variables, constants, type conversion, reference variables, arrays, statements, methods - class methods and instance methods, error detection and correction: exceptions, try-catch blocks. February 2: Happy Groundhog Day! Local groundhogs did bnot see their shadows this morning, though I hear that Punxatawny Phil did. So, as the legend goes, six more weeks of winter in Punxatawny but for us (hopefully!) spring is around the corner. We will continue today with our review of Java Basics. Learn about exceptions and exception handling, file I/O in Java using the Scanner class. Read: All this is material from Appendix A, continue to read that section. Lab#2: Be sure to work through the Lab handout from class. You have to hand in your Lab Report on Monday, February 9. February 4: File I/O and exception handling examples. Doing object-oriented programming (OOP) in Java. Designing classes (basic UML), writing code to implement classes. Deliberating about public and private prefixes in class design. Examples. February 9: OOP in Java. Designing classes. Inheritance in OOP. Example: Fraction class. Read: Chapter 1 from K&N. Lab#3: This lab will help you start and complete Assignment#3. Click here for the lab handout. Click here for the Lab Log. February 11: ADTs and Interfaces in Java. The Java Collections Framework (an introduction). The ArrayList class in Java. Under the hood: implementing your own list class (using fixed size arrays). Read: Chapter 2 from K&N. February 16: Implementing our own List ADT: Version 1 (Using fixed size arrays), Version 2 (Making it generic), Version 3 (Using dynamic arrays). Comparing it to Java ArrayList. Read: Chapter 2 from K&W. February 18: Computational Complexity. CPU speeds (FLOPS) and what they mean. Big-Oh notation for worst case complexity of algorithms. Growth rates of some common functions. February 23: Exam 1 is today. February 25: Exam review. Linked Lists: Design & implementation. March 2: Implementing Linked Lists. Comparing List implementations. March 4: No class. Deepak is out of town. March 16: Review of Assignment#4, linked lists. Introduction to Stacks & Queues. Stack applications: pre/post fix expressions. Using Iterators. Read: Chapters 3 & 4 from K&W. March 18: No class due to Community Learning Day. March 23: Queues: Applications. Discrete Event Simulation. March 25:Recursion. Writing recursive functions. March 30: Exam 2 is today. April 1: Sorting, Part 1 (Basic sorting algorithms): Bubble Sort, Selection Sort, Insertion Sort. Complexity/Comparison. Read: Chapter 8 (SEctions 8.1-5 only). April 6: Sorting, Part 1 (Basic sorting algorithms): Bubble Sort, Selection Sort, Insertion Sort. Complexity/Comparison. April 8: Hierarchical Data Structures: Trees - terminology and properties, binary trees, expression trees, binary search trees, tree traversals: Preorder, inorder, and postorder traversals. April 13: Implementing Binary Trees. April 15:Implementing Binary Search Trees. The Comparable interface in Java. Defining your own exceptions. April 20: Heaps & Priority Queues. Sets and Maps in Java Collections Framework. Hash Tables: An introduction. April 22: Hash tables internals: Open Addressing (w/ Linear Probing, Quadratic Probing), Chaining. Sorting: Quick Sort, Heap Sort, Merge Sort. How to sort using Java libraries. April 27: Quicksort algorithm. Intuition behind Merge Sort. Course Review. April 29: Exam 3 is today. Attendance and active participation are expected in every class. Participation includes asking questions, contributing answers, proposing ideas, and providing constructive comments. As you will discover, I am a proponent of two-way communication and I welcome feedback during the semester about the course. I am available to answer questions, listen to concerns, and talk about any course-related topic (or otherwise!). Come to office hours! This helps me get to know you. You are welcome to stop by and chat. There are many more exciting topics to talk about that I won't have time to cover in-class. Please stay in touch with me, particularly if you feel stuck on a topic or assignment and can't figure out how to proceed. Often a quick e-mail, phone call or face-to-face conference can reveal solutions to problems and generate renewed creative and scholarly energy. It is essential that you begin assignments early. There will be 6-8 assignments, weighted equally in the final grading (see below). Assignments must be submitted according to the instructions provided in each assignment. Incomplete grades will be given only for verifiable medical illness or other such dire circumstances, if supported by your Academic Dean in a written/electronic communication. The class meetings/lectures will be a place to learn the concepts that are a part of the syllabus. I will, in the course of a lecture, write code on the board, and/or even do some live coding in class. The objective of this is to illustrate to you how to go about applying the concepts in practice. It is NOT a place for you to open your laptops and start to code with me. In fact, you are encouraged NOT to bring your laptops to class to use them for any purpose. It is distracting to other students. Phone (smart or otherwise) and tablet use during class meetings is also strongly discouraged. Listen, understand, ask questions, and take notes in a notebook if you need to. You will learn more! The assignments in this course are a place for you to exercise your learning of the concepts and apply them in actual working programs. The best way to get the most of of this course is to try out and code the concepts learned in the class (outside the class!). Do not be afraid to try things! This will improve your understanding and raise questions that you should feel free to bring forward in class. A quick word of advice: stay abreast of the material covered in class, and start your assignments on the day they are announced. All work must be turned in either in hard-copy or electronic submission, depending on the instructions given in the assignment. E-mail submissions, when permitted, should request a "delivery receipt" to document time and date of submission. Extensions will be given only in the case of verifiable medical excuses or other such dire circumstances, if requested in advance and supported by your Academic Dean. No assignment will be accepted after it is past due. No past work can be "made up" after it is due. No regrade requests will be entertained one week after the graded work is returned in class. There will be three exams in this course. The exams will be closed-book and closed-notes. The exams will cover material from lectures, homeworks, and assigned readings. The readings and lecture topics can be group work. Please discuss the readings and associated topics with each other. Work together to understand the material. I highly recommend forming a reading group to discuss the material -- I will explore many ideas and it helps to have multiple people working together to understand them. It is fine to discuss the topics covered in the homeworks, to discuss approaches to problems, and to sketch out general solutions. However, you MUST write up the homework answers, solutions, and programs individually without sharing specific solutions, mathematical results, program code, etc. If you made any notes or worked out something on a white board with another person while you were discussing the homework, you shouldn't use those notes while writing up your answer. Under ABSOLUTELY NO circumstances should you share computer code with another student, printed, electronic, or otherwise. Similarly, you are not permitted to use or consult code found on the internet for any of your assignments. Exams, of course, must be your own individual work. If you have any questions as to what types of collaborations are allowed, please feel free to ask. Created on January 6, 2015.